R.R. Lutz's is among the very few with a collection of his life's work among the archives of the Smithsonian Institution. Rolland was the youngest child born to Concheta F. and George W. Lutz. His father was a Methodist minister. His mother was a music teacher and named him after her favorite contemporary author. Concheta was extremely active in the Women's Christian Temperance Union, prompting Susan B. Anthony to agree to be godmother to Rolland's sister Abigail. His other siblings were George and Imogene. Born in 1887 in South Dakota, he spent his childhood years in St. Paul Minnesota and would eventually attend Hamline University there. He subsequently worked in a pharmacy, for the Teton, MT Gamble School District, and as a farmer in South Dakota. At the age of 27, he took a chance and turned a hobby into a career with the purchase of the Peter Holmboe Photographic Studio which had been for sale in Mandan in 1914. Rolland had dated an older sister of Laura Chapman of Lanesboro, MN but was smitten with the younger sister from the start. Years later, after she had come of age and after obtaining her father's approval, Rolland and Laura were married on November 17, 1914. The ceremony was held in his photographic studio at 202 Third Ave NW in Mandan. Together they had four children: Gloria (Goller), 1915; Rolland, 1922; George, 1923; Laurie (Obergottsberger) 1932. 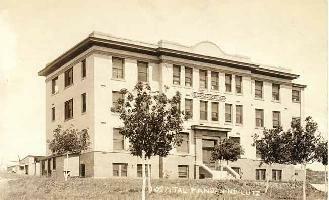 Mandan's first library was sandwiched between their best known residence at 206 3rd St NW and the photographic studio. In the early 1900s, photographic technology was concentrated among professionals due to cost and complexity of camera equipment and film chemistry. Local photographers throughout the nation recorded slices of American life before cameras became commonplace. The majority of his film library was lost in the 1943 Heart River flood, but his work survives as real photograph postcards (RPPC) which were distributed and are collected nationally. Lutz benefited from the longest running cottage industry in Mandan. 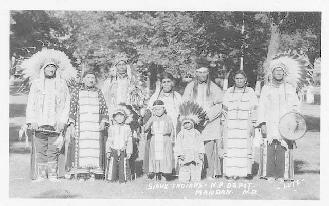 Starting in 1917, members of the Standing Rock Sioux nation were hired by the Northern Pacific Railway to perform in depot park as a tourist attraction for patrons who selected the NP line verses their competitors line which ran through Minot. The practice typically occurred June through September each year, and continued through 1946. They would charge a quarter to pose for custom pictures in full traditional dress. Lutz mass marketed these images as postcards for a nickle each. In his free time, Lutz bred canaries and springer spaniel dogs. He also raised roses and gladiolus and placed second of 504 entries at the 2nd annual ND Gladiolus Show/ 11th annual Mandan Civic Garden Flower Exhibit in 1933. Music was a central theme in their household. His wife Laura was the first paid soloist at the First Presbyterian Church while Rolland served as director of Mandan Methodist Episcopal choir. He was a member of the Mandan Municipal Band, and managed the group in 1926 and 1928. He was also director of the Mandan Music Club, which provided community performances throughout the years. He served on the Mandan Park Commission starting in 1930 until 1937. A lifelong member of the Rotary Club, he also belonged to the ND Photographers Association. Mr. Lutz sold his practice to Lee Mohr in 1937 and moved his family at his wife's request who was tired of the extreme winter weather. They journeyed by rail to Tacoma, WA where he had bought a studio there. He concentrated on portrait photography until his retirement. Rolland Lutz gained national attention when honored with the title "Master Photographer of America." The Lutz's moved to Bainbridge Island, WA upon retirement to be nearer to their children and grandchildren. He died in 1964. He and his wife are buried on Bainbridge Island WA. Notes: No connection has been identified between the Rolland Lutz and family and the George Lutz and his family that settled in Jamestown ND area in the 1880s. Nor any connection to the famous Philadephia area photographer Karl F. Lutz who was practicing at approximately the same time. The Society would like to thank the daughters of Rolland Lutz, Mother Gloria Mary Goller and Laurie Obergottsberger for sharing this information with us. Special recognition for Barbara Handy-Marchello and Sharon Silengo of the State Historical Society of North Dakota who contributed to the research effort of this Legacy Program biography.